Facebook Test account is a type of account made only for app developers, and security researchers. They can use it to investigate security vulnerabilities or to interact with his/her apps. An App developer is allowed to create 50 Developer Test Accounts for testing apps. Now, you must be thinking what’s the difference between a Facebook real account and test account. So, let me clear your difference without wasting any more time. Test Account is invisible to Normal users OR real account users. A Test Account can interact with other Test Accounts but not with the real User Account. Test Account can not be converted to real user account. Test Account can not be like Facebook pages and obviously can’t write on Facebook pages timeline. Test account is free Facebook spam or fake account detection systems which means the guys at Facebook can’t disable it for being Fake or violating any other reason. 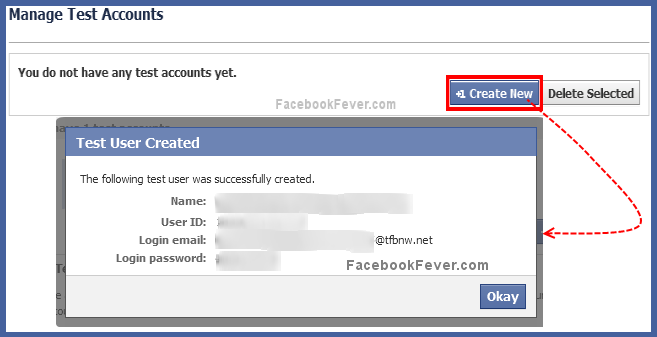 How To Create Facebook Test Account? You can create Facebook Test Account by going to this link. Click on the Create New to make a Facebook test account. Now, in the next screen you’ll see your test account credentials there such as name, username, password, email etc. If you want to create another test account or reset password of test account or to delete any Facebook Test account, just again visit this link. So, it’s all about the Facebook’s Test Account. If you like this post, feel free to share with your online circles. Or if you have any query just drop it in the comment section, we’ll reply to it as soon as possible! 83 Million Facebook Fake Accounts Will Be Deleted Soon Facebook to Block Fake Likes; Wins $2 Billion From Suing Spammers How To Protect Your Facebook Account From Spam Applications Ultimate Guide To Secure Your Facebook Account [Must Read] How to completely delete a Facebook account?